In 1931 Will B. Johnstone worked with Morrie Ryskind on an unused radio sketch for the Marxes when Groucho suggested a collaboration with S.J. Perelman for another proposed radio series. Perelman is quoted by Simon Louvish in Monkey Business - the Lives and Legends of the Marx Brothers; "We put in a couple of enjoyable sessions that got nowhere, except for a misty notion that the Marxes might be characterized as stowaways aboard an ocean liner." Groucho told them that "this isn't any fly-by-night radio serial - it's our next picture!" In addition to co-writing the script for Monkey Business, Will B. Johnstone also produced the cartoon for the pressbook. The film was released on 7 November 1931. 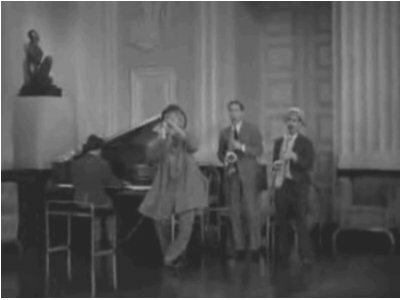 In many ways Monkey Business (which went under the working title Pineapples) presented an opportunity for the Marx Brothers to re-use old routines. The basic plot is a developed version of their vaudeville show Home Again and the imitation of Maurice Chevalier and his song You Brought A New Kind Of Love To Me from Paramount's The Big Pond is a revamped version of Theatrical Agency from On The Balcony and I'll Say She Is. Earlier in 1931, the scene itself was re-enacted by the Marxes in a film called The House That Shadows Built, put together by Paramount in recognition of their 20th anniversary. 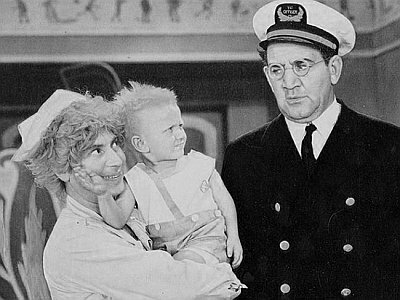 Apart from reminiscences of the vaudevillian past, the basic storyline of Monkey Business also closely resembled The Seas Are Wet, a film idea from young Bert Granet about Marxian antics on a cruise ship. Granet also submitted another idea, College Daze, set on a campus. When Paramount first produced Monkey Business and then Horse Feathers without any acknowledgments or even the knowledge of Granet, he sued the film company. Paramount settled by hiring Granet as a screenwriter alongside Arthur Sheekman on a Bing Crosby picture. Later in life Granet and his wife Charlotte became two of Groucho's closest friends. There are several differences between the final script (provided by Marie Sunny and dated 11 April 1931) and the finished film. One example is a sequence in the ship's nursery, which followed the Punch & Judy show. It got as far as production and stills show child actor Billy Barty with Harpo in a nurse's uniform. Another is the scaled-down conclusion. Instead of Zeppo and Briggs fighting in the barn, the fisticuffs was to take place at a warehouse brewery with Briggs ending up being socked into a vat of beer. The Monkey Business topper scene had Harpo enjoying a swim in another vat of beer, his head coming up with a smile, spurting a little beer out of his mouth before diving again after honking his horn. The scripted finale was probably scrapped for cost and technical reasons - in addition to the bootlegger setting, the warehouse also had a steam hoist whose moving long arm and attached pincher figured prominently in the final comedy battle. 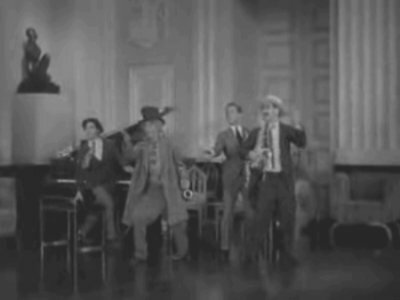 Also lost was an artistically symmetrical fade out with Groucho, Harpo and Chico once again singing in barrels (as they do in the film's beginning), this time on the private yacht of Joe Helton (named Joe Farina in the script), while Zeppo and Mary Helton kissed nearby.